Hannah Fry leads a nationwide experiment to help plan for the next deadly flu pandemic, which could happen at any time. How many will it kill? What can we do about it? The government rates the global outbreak of a deadly flu virus as a major threat to the UK. It could happen at any time. To predict the impact of the next pandemic more accurately than ever before, new data is needed - and lots of it. Dr Hannah Fry is on the case. What have eggs got to do with the flu vaccine? How did Spanish Flu get its name? BBC Pandemic could be key in preparing for the next pandemic outbreak. In order to better understand how an infectious disease like flu can spread, researchers need data about how we travel and interact. All data collected from the app will be sent to a research team from the University of Cambridge and the London School of Hygiene and Tropical Medicine. The data collected between September and November 2017 was used to simulate the spread of a highly infectious flu across the UK and predict how many of us might die - the results are revealed in Contagion! The BBC Four Pandemic. The data collected between December 2017 and December 2018 will contribute to this new gold-standard set for use in future simulations and in wider Pandemic research. Participation in the study is entirely voluntary, and all data will be grouped to ensure your anonymity. You can opt out at any time. *Please note, the BBC Pandemic Experiment ended in December 2018, it is no longer possible to take part. Thank you to everyone who took part. 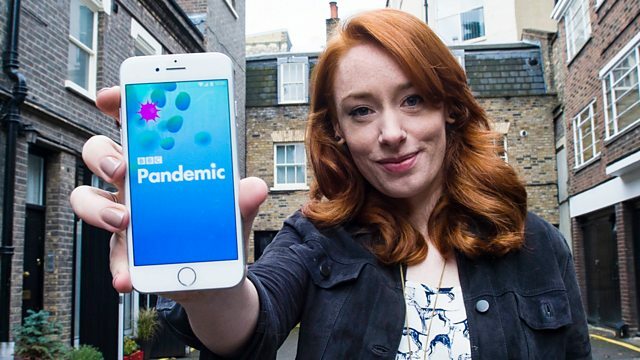 The more people of all ages that take part in BBC Pandemic, the better that data will be so the app will be available until the end of Dec 2018. By identifying the human networks and behaviours that spread a deadly flu, BBC Pandemic will help to make these models more accurate and, in turn, help to stem the next pandemic. BBC Science: Why can’t we beat viruses?